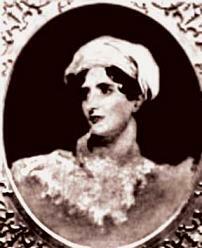 421 Lady Callcott (Mrs Graham) (1785 - 1842) One of the spectacular exceptions to the English Memsahibs was a woman called Maria Graham who came to India with her father Rear-Admiral George Dundas of the Royal Navy. She married Capt Thomas Graham of the Royal Navy. 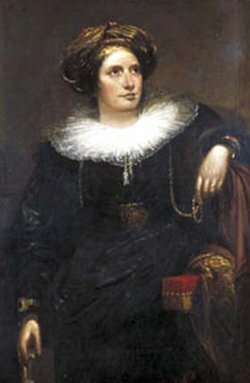 Later she became Lady Callcott by her second marriage. Her 'Journal of a Residence in India', dealing with her experiences mainly in the coastal areas of India during the period from 1809 to 1811 was first published in England in 1812. She was culturally very different from most of the English Ladies who came to India along with their husbands. 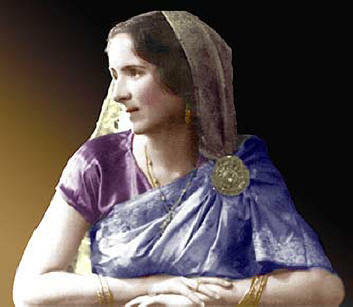 She was a great lover of India and clearly stated in her Journal that one of her purposes was 'to exhibit a sketch of India's former grandeur and refinement so that I could restore India to that place in the scale of ancient nations, which European historians have in general unaccountably neglected to assign to it'. She wrote eloquently about the grandeur of Sanskrit language and literature, its majesty of thought and loftiness of expression. 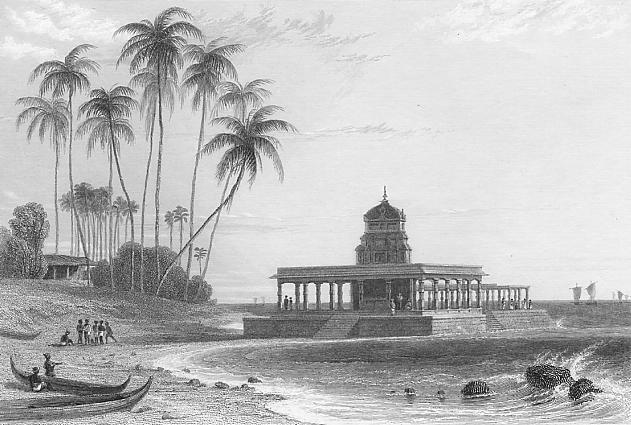 She went to Mahabalipuram along with a Brahmin servant of Col Colin Mackenzie and stayed there for three days. The Oriental Manuscripts Library in Madras today contains all the manuscripts collected by Col Mackenzie between 1792 and 1815. 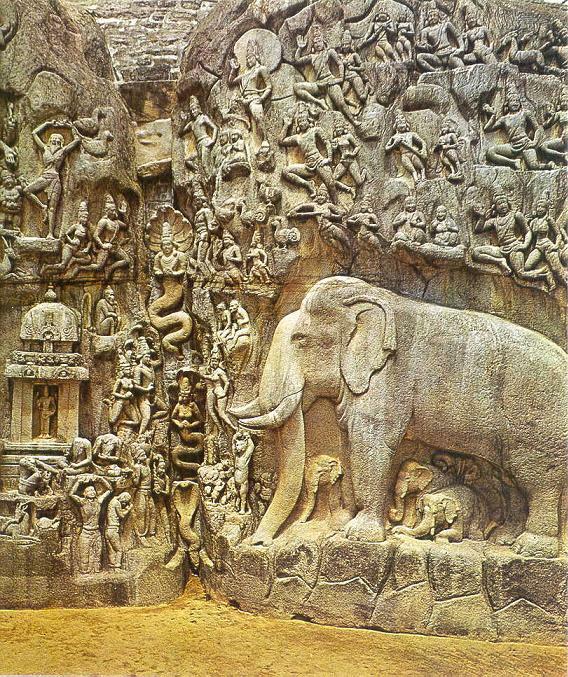 Lady Calcott gave a beautiful description of Mahabalipuram and its environs in her Journal. She wrote eloquently about the grandeur of Sanskrit language and literature, its majesty of thought and loftiness of expression. Which was written eight years before the birth of Max Mueller and almost half a century before he published the first volume of his famous series 'Sacred Books of the East'. 'Were all other monuments swept away from the face of Hindustan, were all its inhabitants destroyed, and its name forgotten, the existence of the Sanskrit language would prove that it once contained a race who had reached a high degree of refinement, and who must have been blessed with many rare advantages before such a language could have been formed and polished. Amidst the wreck of nations where it flourished, and superior to the havoc of war and conquest, it remains a venerable monument of the splendour of other times, as the solid Pyramid in the deserts of Egypt'. This was written eight years before the birth of Max Mueller and almost half a century before he published the first volume of his famous series 'Sacred Books of the East'. (source: Lady Callcott in Madras, a great lover of Sanskrit - By V Sundaram - newstodaynet.com). For more refer to chapters on European Imperialism and First Indologists and Sanskrit. 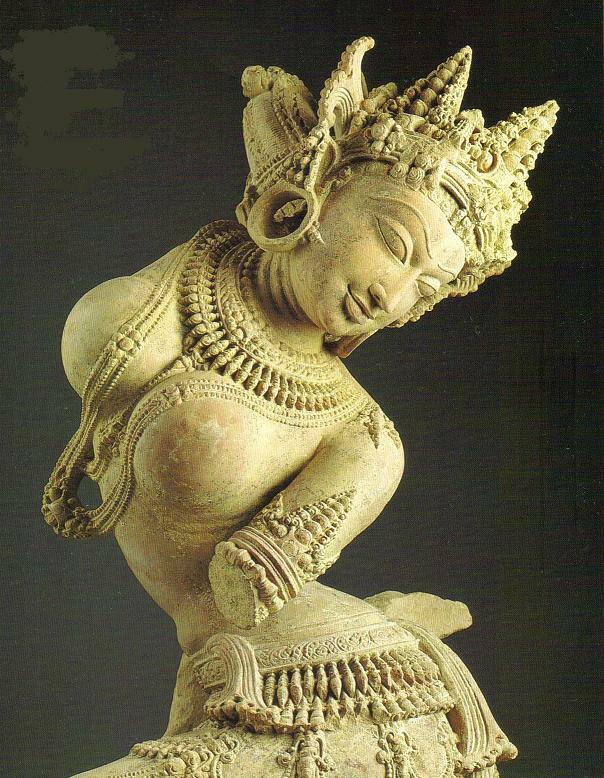 Dancing Devata, stone, early 12th century, Uttar Pradesh, India. (image source: Metropolitan Museum of Art). 422. 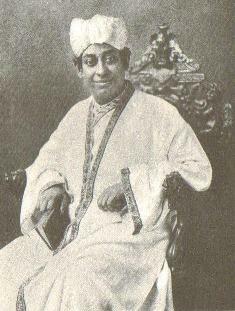 Sir Brajendranath Seal (1864-1938) Knight Vice Chancellor Mysore University. Seal's major published work is The Positive Sciences of the Ancient Hindus, which, besides being a work on the history of science, shows interrelations among the ancient Hindu philosophical concepts and their scientific theories. Sir Brajendranath Seal, had coined a very appropriate term to describe India as 'ever ageing but never old'. That is also the meaning of Sanskrit word purana which usually means ancient and old. Shankaracharya in his commentary of Gita describes Atman, the infinite self of man as Purana. "The Hindus no less than the Greeks have shared in the work of constructing scientific concepts and methods in the investigating of physical phenomena, as well as of building up a body of positive knowledge which has been applied to industrial technique; and Hindus scientific ideas and methodology (eg. the inductive method or methods of algebraic analysis) have deeply influenced the course of natural philosophy in Asia - in the East as well as the West - in China and Japan, as well as in the Saracen Empire. " "that the Sankya-Patanjali system of cosmology expresses the fundamental idea of conservation, transformation, and dissipation of energy. Every phenomena in the universe is based on the interaction of intelligence, energy and mass. This is modern physics in a nutshell - a world view that was born out of the ashes of the materialistic and mechanistic views of classical physics of the Eighteenth and Nineteenth Centuries." (source: The Positive Sciences of the Ancient Hindus - By Sir Brajendranath Seal). 423 Professor Edward Washburn Hopkins (1857-1932) graduated at Columbia University in 1878, studied at Leipzig, where he received the degree of Ph.D. in 1881 and became professor of Sanskrit and comparative philology in Yale University in 1895. He became secretary of the American Oriental Society and editor of its Journal, to which he contributed many valuable papers, especially on numerical and temporal categories in early Sanskrit literature. "Plato is full of Sankhyan thought, worked out by him, but taken from Pythagoras. Before the sixth century B.C. all the religious-philosophical idea of Pythagoras are current in India (L. Schroeder, Pythagoras). If there were but one or two of these cases, they might be set aside as accidental coincidences, but such coincidences are too numerous to be the result of change. " And again he writes: "Neo-Platonism and Christian Gnosticism owe much to India. The Gnostic ideas in regard to a plurality of heavens and spiritual worlds go back directly to Hindu sources. Soul and light are one in the Sankhyan system, before they became so in Greece, and when they appear united in Greece it is by means of the thought which is borrowed from India. The famous three qualities of the Sankhyan reappear as the Gnostic 'three classes." (source: Religions of India - By Edward Washburn Hopkins p. 559-560). 424. Henri Bergson (1859 - 1941) French Philosopher and the son of a Jewish musician and an English woman, was educated at the Lycée Condorcet and the École Normale Supérieure, where he studied philosophy. 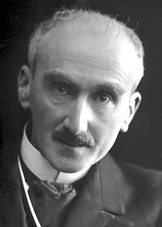 After a teaching career as a schoolmaster, Bergson was appointed to the École Normale Supérieure in 1898 and held the chair of philosophy at the Collège de France. He was elected to the Académie Française; then was president of the Commission for Intellectual Cooperation of the League of Nations. "From the earliest times divine and many of the great pilgrimages of Hindu India were focused upon sacred rivers such as the Ganges, Indus, Yamuna, Krishna, Godavari, and Brahmaputra. The largest religious festival in the world today, held every 12 years near Allahabad, India and attracting upwards of twenty million pilgrims, takes place at the confluence of two rivers." 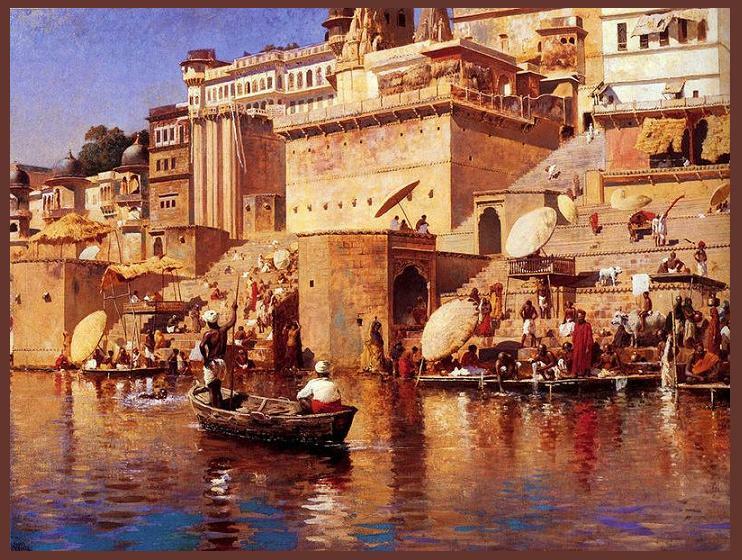 (image source: Paintings by Edwin Lord Weeks 1849 - 1903). The power of that blended water is said to grant a spiritual realization that does not die with the passing of the human form. Holy mountains were also known to be sources of sacred waters. Upon their lofty summits resided storm gods and weather deities, whose gifts of rain sustained all plant, animal and human life. Particular frozen waters were also favored and pilgrims still trek long distances in the high mountains to reach Amarnath cave in Kashmir and Lake Manosarovar (the lake was first created in the mind of the Lord Brahma. Hence, in Sanskrit it is called "Manas sarovara", which is a combination of the words manas (mind) and sarovara (lake) in Tibet. The descent of the River Ganga. Sacred stories and hymns speak of the waters of the Ganges as the fluid medium of Lord Shiva's divine essence and a bath in the river is believed to wash away all of one's sins. "There whatever is sacrificed, chanted, given in charity, or suffered in penance, even in the smallest amount, yields endless fruit because of the power of that place. Whatever fruit is said to accrue from many thousands of lifetimes of asceticism, even more than that is obtainable from but three nights of fasting in this place." One of seven Holy Cities of India, one of twelve Jyotir Linga Shiva sites and a Shakti Pitha goddess site as well, riverside Banaras is also the most favored place for Hindus to die. Cremation at the holy city insures moksha, or final liberation of the soul from the endless cycle of birth, death and rebirth. Dying persons and dead bodies from far-off places are brought to Banaras for cremation at the five principal and eighty-eight minor holy sites along the river Ganges . But the water borne holiness of the ancient city is not limited to the river alone. Adjacent to Visvwanatha temple, the city's primary Shiva Linga, flows the Jnana Vapi well, the ritual center and axis mundi of Banaras . 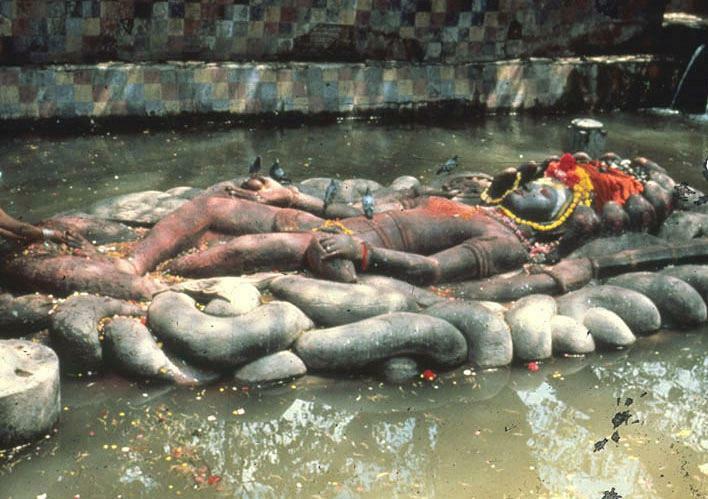 The Jnana Vapi, or Well of Wisdom, is said to have been dug by Shiva himself, and its waters carry the liquid form of jhana, the light of wisdom. Encircling the holy city at a radius of five miles is the sacred way known as the Panchakroshi Parikrama. Pilgrims take five days to circumambulate Kashi on this fifty-mile path, visiting 108 geomantically situated shrines along the way. If one is unable to walk the entire grid of the sacred geography, then a visit to the Panchakroshi Temple will suffice. By walking round the sanctuary of this shrine, with its 108 wall reliefs of the temples along the sacred way, the pilgrim makes a symbolic journey around the sacred city. Another important Banaras pilgrimage route is the Nagara Pradakshina, which takes two days to complete and has seventy-two shrines. At evening, priests perform aarti (worship with lighted lamps) at some of the more famous ghats & the scene is just beyond descriptions. Thousands of people attend this aarti ceremony, including hundreds of foreigners. Varanasi or Banaras in the state of Uttar Pradesh in Indiais the oldest living city in the world. 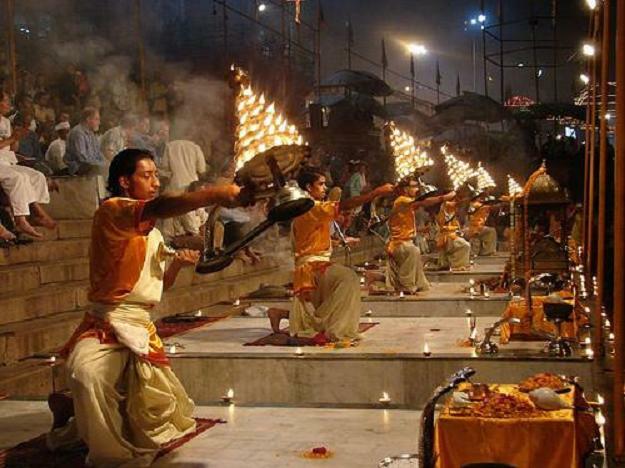 Established in 7th century B.C., Varanasi is the holiest of the holy cities to Hindus. (image source: asis k. chatt's photostream). The sacred architecture of the temples on both these sacred geographies was designed with the mathematical and magical formulas of Vastu Purusa, an Indic geomantic system similar to but older than Chinese Feng Shui. 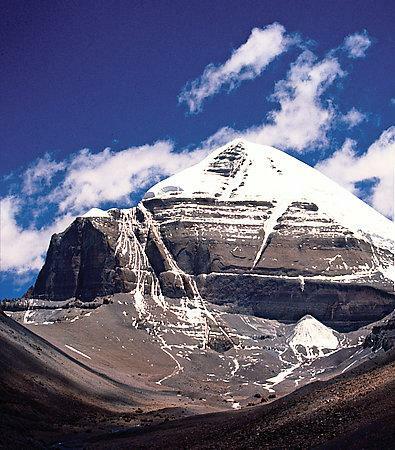 Hindus call the sacred places to which they travel tirthas, and the action of going on a pilgrimage tirtha-yatra. The Vedic word tirtha means river ford, steps to a river, or place of pilgrimage. Tirthas are more than physical locations, however. Devout Hindus believe them to be spiritual fords, the meeting place of heaven and earth, the locations where one crosses over the river of samsara (life and death in the illusion of the material world) to reach the distant shore of liberation. As thresholds between heaven and earth, tirthas are bridges for psychic sojourns and the passage of prayers, they are portals into our physical realm for spirits and deities, angels and elementals. "Karma has quite a karma. Long after India's seers immortalized it in the Vedas, it suffered bad press under European missionaries who belittled it as "fate" and "fatalism," and today finds itself again in the ascendancy as the subtle and all-encompassing principle which governs man's experiential universe in a way likened to gravity's governance over the physical plane. Like gravity, karma was always there in its fullest potency, even when people did not comprehend it." 425. Savitri Devi (1905 - 1982) was born Maximiani Portas, of English and Greek parents in Lyons, France. After becoming a Greek national she took to Hellenism, and was disillusioned with Christianity. It was the swastikasigns on the palace of Athens, built by 19th century German archaeologist Heinrich Schliemann, that stirred Maximiani's first feelings for the Aryan race. She left for India to search for the roots of the Aryan civilisation. She regarded Hinduism as the only living Aryan heritage in the modern world and was convinced that only Hinduism could take on and oppose the Judaeo-Christian heritage. Soon, she adopted the name Savitri Devi which would make her famous in neo-Nazi circles. India fascinated her - she noted now even a street-side vendor would discuss the Mahabharat in the morning. In 1939, she published A Warning to Hindus under the auspices of the Hindu Mission. In the book, she scorned the Congress for its secular policies and said there was no India but a Hindu one and warned the Hindus not to let the Muslims overwhelm them. In 1939 Savitri Devi met and married a Bengali Brahmin, Asit Krishna Mukherjee, in a Hindu ceremony in Calcutta. During the war the couple gathered intelligence on behalf of the Axis, and Mukherji put Subhas Chandra Bose in contact with the Japanese, who would later support his Indian National Army in its abortive campaign against the British. Saviitri Devi born Maximiani Portas, was disillusioned with Christianity and she took to Hellenism. India fascinated her deeply. She regarded Hinduism as the only living Aryan heritage in the modern world and was convinced that only Hinduism could take on and oppose the Judaeo-Christian heritage. "We defend Hinduism, because it is India’s very self-expression; and we love India, because it is India." Hinduism is really superior to other religions, not for its spirituality, but for that still more precious thing it gives to its followers: a scientific outlook on religion and on life." "Even if India itself were to disappear just now, the philosophical and spiritual inheritance of the Hindus would remain. Mankind would preserve Hinduism, because it is worth preserving. It is immortal, and needs no one to defend it." “If those of Indo-European race regard the conquest of pagan Europe by Christianity as a decadence, then the whole of Hindu India can be likened to a last fortress of very ancient ideals, of very old and beautiful religious and metaphysical conceptions, which have already passed away in Europe. Hinduism is thus the last flourishing and fecund branch on an immense tree which has been cut down and mutilated for two thousand years." "Hinduism is the most perfect type of such "religions" Apart from the high philosophies contained in the Hindu Scriptures and from the high spiritual ideal realized by the Hindu seers, we want to defend Hindu civilization and society, against the increasing forces of rival proselytizing societies strongly united by the consciousness of a common creed. Even if India itself were to disappear just now, the philosophical and spiritual inheritance of the Hindus would remain. Mankind would preserve it, because it is worth preserving. It is immortal, and needs no one to defend it." "We defend Hinduism, because it is India’s very self-expression; and we love India, because it is India." Hinduism is really superior to other religions, not for its spirituality, but for that still more precious thing it gives to its followers: a scientific outlook on religion and on life. Hindu spirituality is a consequence of that very outlook. That scientific character of Hinduism should be looked upon by the Hindus as their strength, not as a weakness, like some seem to believe. The man of one book and of one creed may be strong, for the time being; but in the long run, it is a strength (and the greatest of all strength) for a religion, to have no particular founder, no particular book, no particular creed, settled once forever; to be just a continuous flow of thought, in search of knowledge, on the basis of a continuously renewed experience." " free thought in all matters, including religion, is a feature of Hinduism." Philosophically, Hinduism is an attitude of mind, and an outlook on life. The Hindus are one of the few modern civilised people who are openly Pagans." The Hindus are one of the few modern civilised people who are openly Pagans. "Creation is only half the Play of Existence. Men thus generally worship only one side of God. But the Hindus praise Him all round, for the beauty of His Play. They praise Him in Destruction, as well as in Creation. They praise His Energy (Shakti) in Mother Kali, in Durga, in Jagaddatri, in Chinnamasta, continuously destroying and recreating Her own Self; in all the ten “Mahavidyas,” who are one and the same. They praise Him in the Dancing King (Shiva Nataraj), whose feet are over-treading life, and destroying it in a furious rhythm, . . . while His dispassionate face, expressing Knowledge, is as calm as the smiling sea. Creation and destruction are one, to the eyes who can see beauty. "And the greatest praise to India is this: not only are her people beautiful; not only are her daily life and cult beautiful; but, in the midst of the utilitarian, humanitarian, dogmatic world of the present day, she keeps on proclaiming the outstanding value of Beauty for the sake of Beauty, through her very conception of Godhead, of religion and of life." (source: L'Etang aux lotus (The Lotus pond) - By Savitri Devi, and A Warning to the Hindus - By Savitri Devi). Refer to The strange case of Savitri Devi - By Koenraad Elst. 426. Sir George Edward Gordon Catlin (1896 -1979) was an English political scientist and philosopher. A strong proponent of Anglo-America cooperation, he worked for many years as a professor at Cornell University and other universities and colleges in the United States and Canada. 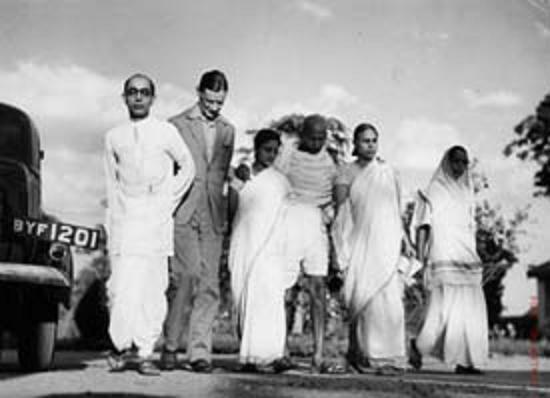 He was an early advocate of Indian independence after meeting Mahatma Gandhi in 1931 in London. He visited India in 1946 and 1947 and published his tribute to Gandhi after his assassination with In the Path of Mahatma Gandhi (1948). (source: In the Path of Mahatma Gandhi - By George Edward Gordon Catlin). "Broad-based and lofty, Hinduism was and impressive structure? Mohammedanism, with its simple theology and simple dualism, offered no comparison?" "The conviction that seeming diversities and differences are but passing and rhythmically varying phases of a fundamental unity led the East to symbolize Life and Death as the ever supple and continuously flowing Dance of Civa, in which construction and destruction are rhythmically pulsating patterns that the subtle dancer eternally presents and dissolves with the swiftness of a rapidly turning wheel." 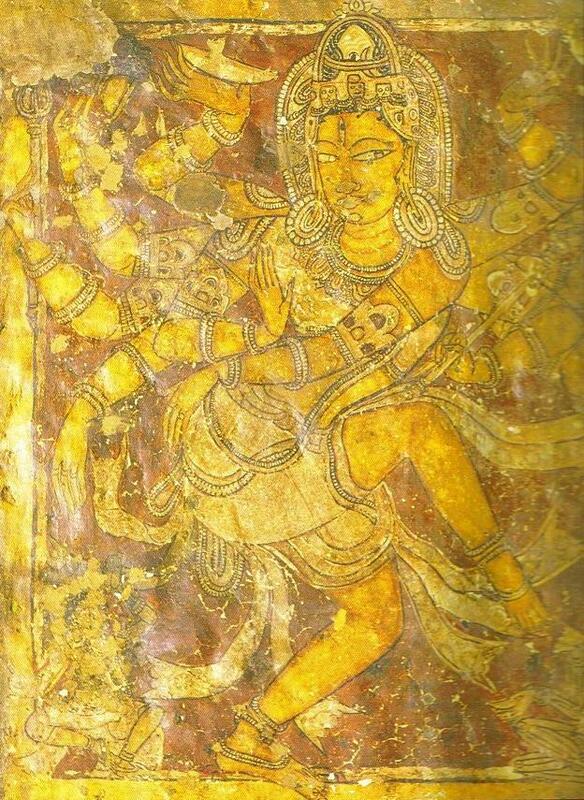 The Dance of Civa (Shiva). The work done by physicists since Rontgen’s accidental discovery has revealed to us Indian conception of the Dance of Civa – which is continuous, and which is both constructive and destructive at one and the same time." "Modern science, likewise, is conquering fresh fields of knowledge since it became aware that many traditional barriers are illusory. Civilization itself is a ceaseless rhythm in which Western and Oriental characteristics are vividly remembered patterns rather than actual attitudes arrested in their motion." The Book suggests that recognition of the ceaseless and musical flow of the Dance of Civa is the antidote to vain regrets for a pattern that has dissolved only because it never was fixed, and that reverent acknowledgement of this underlying synthetic unity is the most promising cure for the jealousies and misunderstandings that have arisen from a Western habit of assuming that phantom barriers and conventional categories have tangible existence. "Western science has grown up so entirely in the tradition of Western thought that very few have questioned whether the current distinctions between living and non-living, organic and inorganic are based on real differences in kind or merely on the idiosyncrasies of Western modes of thinking. Construction and destruction have been accepted as mutually antagonistic realities. But the work done by physicists since Rontgen’s accidental discovery has revealed to us Indian conception of the Dance of Civa – which is continuous, and which is both constructive and destructive at one and the same time." "If we think how truly an Indian dance is a question of “patterns” – changing patterns that unceasingly melt into one another – the symbolism of the Dance of Civa appears to be poetic in that highest sense in which poetry is a perception of the specific significance and beauty that informs an idea or thing and renders it alive and valid. The Western no less than the Eastern man has always known that the procession of the seasons, and the cycle of seed-time and harvest have been characterized by their continuous rhythm, their “life” dissolving into a sleep of “death” in which a mysterious and unseen activity has gone on which in due time once more emerges, as “life” from death. The beauty of the rhythm – the “Dance” – has again and again kindled poetry in the mind of the men who have reflected on it. " (source: The Dance of Civa or Life's Unity and Rhythm - By Collum p. 1 - 63). 428. Professor Ernest E Wood (1883 - 1965) a Sanskrit and Asian scholar, introduced the Montessori philosophy to the study group who were considering establishing a new nursery school. 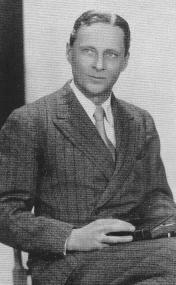 Professor Wood lived in India for 38 years. He founded two University Colleges, acted as President, Principal and Professor of Physics, English and Sanskrit at different times. His love for India and its people, and his deep experience, found expression in active aid to an educational renaissance initiated by the leaders of India, including the poet Rabindranath Tagore. He wrote several books including Practical Yoga and The Glorious Presence. Vedanta is considered in India to be the loftiest achievement in thinking of God. Schopenhauer, Emerson, William James and Whitehead are deemed by the Wood to be most in accord with Vedantist teachings. "The Vedanta philosophy has as its basis the belief that the universe of our experience is only one reality and it can be known." "If truth is truth, how can it be unknowable? Wake up, O man, and look straight, without prejudice, at the facts of being!" Shankara did not leave the Vedanta teaching as a matter of religious belief, however, but said we must verify it by thinking, and the realize it by experience, as did the illumined men of old. This may be a startling claim, until we remember how busy we are in these modern days, how preoccupied with "a number of things," how little we want "to konw" and how much "to have." "The ancient Aryan thinkers who collected, collated, classified and commented upon the thought-traditions accumulated by their distant progenitors performed a rational and ethical service of the greatest value to posterity, when they put together a set of brief sayings, which they called the Vedanata (the end or highest point, of knowledge; the "last word"), and presented them for study along with further statement: "you will not be able to understand or realize the full import of these Great Sayings unless you first put your mind in order by certain practices or disciplines, which we will describe." (image source: Indika: The Country and the people of India and Ceylon - By Rev. John F Hurst). "The Yoga School does not bring God in as Ruler of the World, but as a picture of the ideal soul, for purposes of meditation - a soul self-governed, and unaffected by the sources of the trouble. To this Shankar would raise no objection, for with him there is no objection to idols and images, which have the function of dolls, as assisting the mind to concentrate in its earlier stages. Even the Vedantist can meditate on God, provided he remembers that there is no such external being, and so such being at all unless that is also his own self." (source: The Glorious Presence: A study of the Vedanta Philosophy and its relation to Modern Thought - By Ernest E Wood p. 1 - 243). 429. 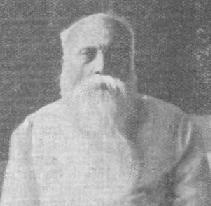 S N (Surendranath) Dasgupta (1887 - 1952) Sanskrit scholar and philosopher. He was the author of several notable books on Indian philosophy and literature, including the famous one-volume a History of Indian Philosophy and Yoga Philosophy. "The Vedas were regarded as revelations of eternal truths, truths which no human reason could ever challenge, naturally divested reason of confidence in its ability to unravel the mysteries of man and of the world. The Vedas, then are the only repository of the highest truths, and the function of reason is only to attempt to reconcile these truths with our experience and sense-observation. Reason was never trusted as the only true and safe guide. This Vedic mysticism prepared the way for the rise of the other forms of mysticism that sprang up in India." "The Upanishads represents one of the most distinctive, types of mysticism that India has produced. The word "Upanishad" has been interpreted etymologically by Shankara to mean "that which destroys all ignorance and leads us to Brahman." It has also been interpreted to mean a secret or mystical doctrine, or a secret and confidential sitting. The Upanishads are mystical experiences of the soul gushing forth from within us; they sparkle with the beams of a new light; they quench our thirst, born at their very sight. It was of these that the German philosopher Schopenhauer said: "How does every line display its firm and definite and throughout harmonious meaning. "From every sentence deep, original, and sublime thoughts arise and the whole is pervaded by a high and holy and earnest spirit." 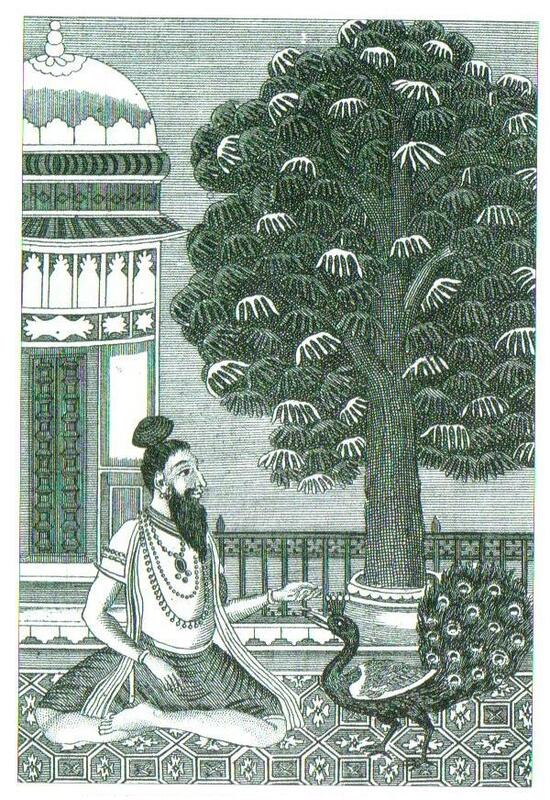 An eighteenth century engraving of a Yogi and a peacock. "Cases are known in which even Christian missionaries, sent out to India to teach church doctrines to clergymen or to preach Christianity among the Indians, became so fascinated by the high and lofty teachings of the Upanishads that they introduced the teaching of the Upanishads in the Church and as a consequence were compelled to resign their posts. " (image source: The Upanishads - Continuum - Ways of Mysticism). "To the Hindus of all denominations there is nothing higher and holier than the inspired sayings of the Upanishads." That downward turned he falls not downward? The guide of his ascending path, - who saw it"
The sage is full of wonder that "the sparkling waters of all rivers flow into one ocean without ever filling it." "The tiller of the soil and the grocer in the shop of India may be uneducated and often wholly illiterate, but even they, while tilling the ground, driving a bullock cart or resting after the work of the day, will be singing songs full of mystical meaning, and for the moment transporting themselves to regions beyond the touch of material gains and comfort. "The sky and the earth are born of mine own eyes. The sweet smell and the bad are of my own nose." "A traveler in the village of Bengal or on board the steamers plying the rivers of the interior or rural Bengal, may often hear a Hindu singing mystical, philosophical or mythical songs of the love of Krishna and Radha while a large crowd of men is assembled around the singer listening to him with great reverence and feeling." "It is only the educated or Anglicized Hindu who dazzled by the gay colors of the West, sometimes turns a deaf ear to the old tune of his country - the flute of Krishna calling from afar through the rustling leaves of bamboos and the coconut groves of the village homes - and, in the name of patriotism and progress, installs a foreign god of money and luxury in the ancestral throne of the god of the Indian heart - the god of deliverance." 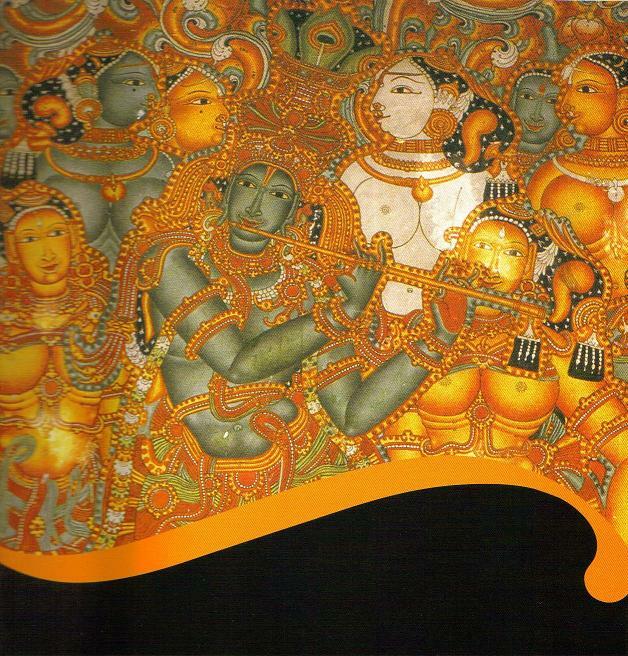 (image from Mural at Mattancherry Palace, Cochin, Kerala). "The singer is probably describing the world as a mirage or a mere phantom show of maya, or is expressing the futility of his worldly life on account of his having lost his friendship with his own self. 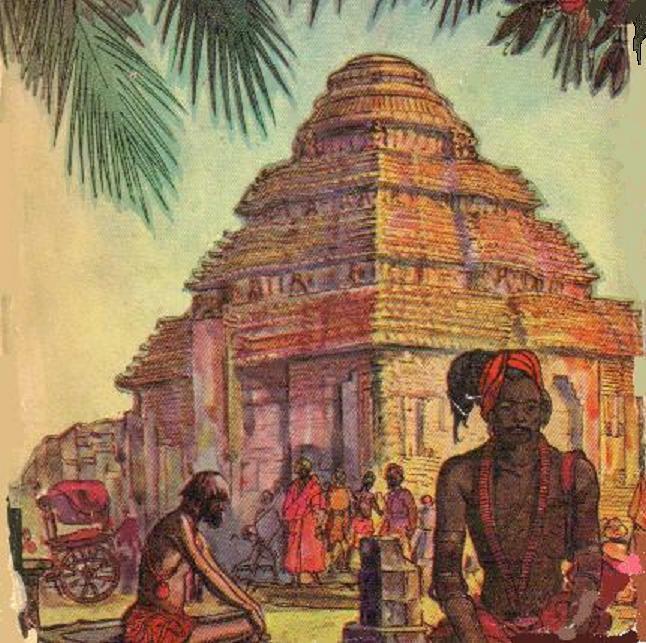 "So the sublime teachings of philosophy and the other worldly aspirations of mysticism, with their soothing, plaintive and meditative tendencies, have watered the hearts of Bengal right into the thatched cottages of this land. Wealth and comfort they all appreciated as do people everywhere, but they all know that money is not everything, and that peace of mind and the ultimate good of man cannot be secured through it or any other worldly thing. They are immersed in the world; but still the wisdom of the ages and the teachings of the saints have not been in vain, and at times they are drawn away from the world - their souls unknowingly long for deliverance and find mystic delight in it. The thoughts and aspirations of the ages, our myths, our religions, our philosophies, our songs and poetry, have all interpreted and formed a whole which cannot be expressed through a portrayal of its elements. They represent a unique experience which I feel with my countrymen, but which is incommunicable to anyone who is unable imaginatively to bring himself into tune with that spirit. The British in India have understood as much of the country as is necessary for policing it, but no foreigner has ever adequately understood our land." (source: Hindu Mysticism - By S N Dasgupta p. 1 - 30 and 141 - 168). The lofty heights reached by the ancient Hindus in the realm of philosophy and religion was established and extensive literature exists on these topics. (source: History of Indian Philosophy – by S N Dasgupta). 430. 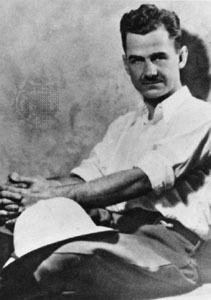 Lowell Jackson Thomas (1892 - 1981) was an American writer, broadcaster. A war correspondent in Europe and the Middle East while in his 20s, Thomas helped make T.E. Lawrence famous with his exclusive coverage and later with the book With Lawrence in Arabia. His radio nightly news was an American institution for nearly two generations, and he appeared on television from its earliest days. Out of his lifelong globetrotting came lectures, travelogues, and more than 50 books of adventure and comment, including Kabluk of the Eskimo and The Seven Wonders of the World. “Hearts ease from the burden of existence – that is the refrain that runs through all the literature of Hinduism. This is true of ancient times as of the present. When the forefathers of the Pilgrim Fathers were still painting themselves a deep blue, Indian culture was known in Babylon , and when the chariot of Boadicea was scything a lane through the Roman ranks, the Romans of Rome were studying Aryan culture. Literary India at the dawn of the Christian era was acting and reacting in a wider world than the West was to know for fifteen centuries. But release, absorption of the self in the cosmic whole, Nirvana, has ever been the keynote. Hindu art-consciousness rests on the sacramental view of life." "The Vedas, believed by the Hindus to be the very Word of God, are among the oldest books in the world, and reveal in beautiful simplicity the life of a pastoral people, the Aryans, who migrated from central Asia to the Indian plains. The Vedas and their glosses and commentaries, forming the vast and as yet only partly translated library of ancient Sanskrit writings, deal with every phase and aspect of human emotion with a particularity and minuteness that have hardly been equaled." "Emile Coue’s (1857 - 1926) formula of getting better and better was long ago anticipated by the mantra of the Ganges-side; Sigmund Freud (1865 - 1939) is an ignoramus beside the psychoanalysis of the Upanishads; while as regards marital relations the Tantras makes Dr. Marie Stopes (1880- 1958) of England seem a girl of seventeen. " Konark Sun Temple was known in English maritime charts as The Black Pagoda. Standing on the edge of a wide beach on the Bay of Bengal, the magnificent pile of weathered and oxidizing ferrugious sandstone soars to a height of 100 feet, it used to form a landmark for sailors far out at sea. 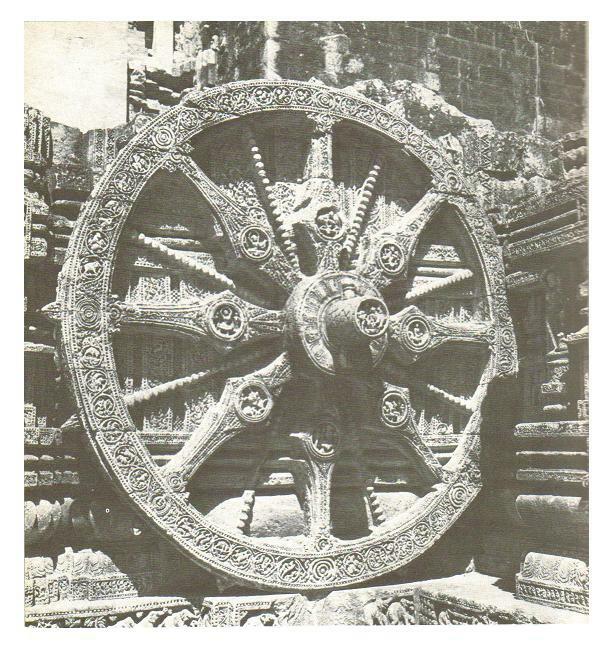 (image source: India: Land of the Black Pagoda - By Lowell Thomas). "Hindus build like Titans, and finish like jewelers.” - wrote Bishop Reginald Heber. Konark, Sun Temple was built during the reign of King Narasimhadeva I (1238 - 64). The temple was conceived as a gigantic stone representation of the Sun God's Chariot. Twelve huge wheels are carved into the plinth, and the building is preceded by seven sculptured horses. 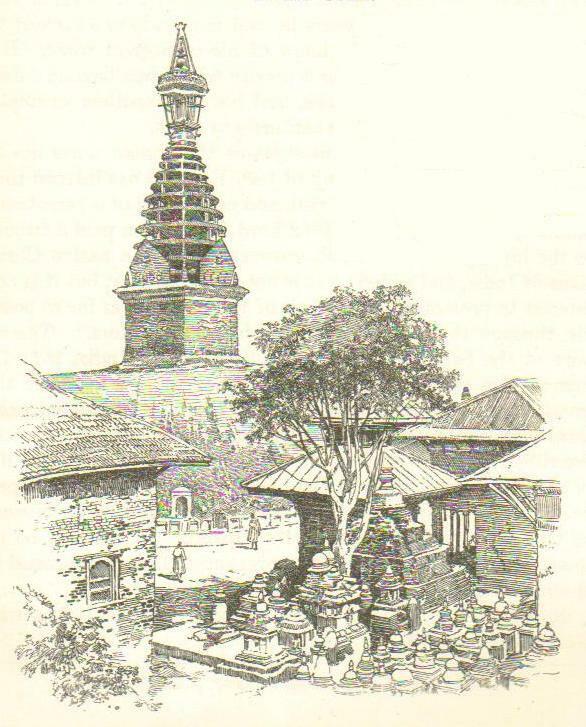 (source: India: Land of the Black Pagoda - By Lowell Thomas p. 238 – 240 and p. 326 – 329). 431. Major Francis Yeats-Brown (1886 - 1944) was the younger son of an English diplomat. The Orient called to him and he became a Bengal Lancer, although every turn of his mind was toward scholarship, literature, and philosophy. His book The Lives of a Bengal Lancer was perhaps the most extraordinary book ever written about India by a westerner. Francis Yeats-Brown liked Indians, so he was not unhappy to be sent to an Indian regiment (17th Cavalry, Indian Army). But his acquaintance with Indians and Indian culture educated him out of humor with Western civilization. "Very humbly and hopefully'' he went to Benares, holy city of the Hindus, there to sit at the feet of Theosophist Annie Besant, How far Yeats-Brown has progressed in the practice of Yoga is not clear. But he tried the primary breathing exercises, says he attained moments of impersonality. "Poised and relaxed and completely in my body (not out of it, as the mystologues would have it) I saw myself at times impersonally. The future lay at my feet. I surveyed it as an interested traveler." In India he plunged deeply into the study of the Hinduism, Vedantism and Yoga. He was a Bengal Lancer who became a yogi and wrote a book called Yoga Explained. (source: India: Land of the Black Pagoda - By Lowell Thomas p. 10 - 12). "Western scholars of our age, when they talk of heritage of the ancient world, still commonly confine themselves to the Mediterranean countries, with Mesopotamia and Arabia and Persia possibly included. The ancient cultures of China and India are omitted. Horace Alexander with Mahatma Gandhi. "But the idea that the Hindu tradition is dead, an idea commonly accepted on the authority of Macaulay and others in 19th century England, needs to be revised. The India of the Buddha, the Mahabharata, and especially of the Bhagavad Gita, has come to a new birth. It is important, therefore, that we examine both its roots and its new vitality." “The Gita emphasizes that the activities of the world must go on. The good man does the tasks to which he is called and which appertain to his place in society. In all his activities, he does things like others outwardly; but inwardly he maintains a spirit of detachment. He does everything without selfish motive, and maintains equilibrium of mind. Self-knowledge is, in fact, the way from immaturity to maturity. Many illiterate and poor Indian villagers are more mature as persons than their western city counterparts, who have wealth, knowledge of the kind that can be acquired through books, technical skills and the other attributes of western civilization. The Gita shows man the way to live a complete and satisfying life." (source: Consider India: An essays in values - By Horace Alexander p. 1 - 26). 433. Ed Viswanathan ( ) is the author of the bestseller book, Am I a Hindu? : The Hinduism Primer (1992) is a form of dialog between a Hindu father and his American-born son. It presents a great overview of Hinduism. Hinduism is not a religion that seeks to convert. In fact Hindus consider it to be absurd to state that only one religion is the true religion of the world. (source: Am I a Hindu? The Hinduism Primer - By Ed Viswanathan Halo Books San Francisco p. 1-5 and 287). 434. Dr. William Ralph Inge (1860 - 1954) Anglican Platonist author in his Christian Mysticism refers to the mystic strains in the early thinkers. "To give a negative account of God is to affirm His immensity of being." (source: Eastern Religions & Western Thought - By. 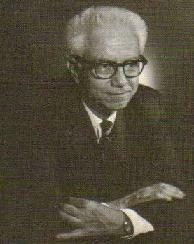 Dr. S. Radhakrishnan p. 293). 435. Richard Schiffman ( ) is nationally known as an on-air journalist whose features regularly appear on the National Public Radio shows: Morning Edition, All Things Considered, and Living of Earth. 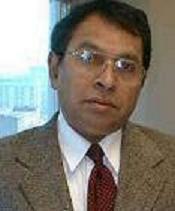 He has studied in India for over four years and is the author of Sri Ramakrisnhna - Prophet for the New Age (1989). Schiffman lived in India for a number of years and studied Hindu spirituality under several spiritual Masters, including the Jillellamudi Mother, Bhagavan Sri Sathya Sai Baba and Mata Amritananadamayi. He is the author of Mother of All, a biography of the Jillellamudi Mother, and former editor of the Matrusi Journal. Sleeping Narayana from Budha Nilakantha, Nepal, circa 8th century. stone more than life size. Lord Vishnu reclining on the coils of a cosmic serpent on the infinite ocean from which the world emerges. The Lord is shown lying down on a thousand-headed snake named Shesha or Ananta Nag - Timeless or Ageless snake. “This primal insight into the dreamlike nature of the world of appearances has an oddly contemporary resonance given the direction of modern scientific thought. Long before post-Newtonian physics “discovered” that matter is essentially energy in drag – E =MC2 – the sages had already intuited that the physical universe is an emanation of the omnipotent Force, which they call Shakti. photo courtesy: Dr. Deepak Shimkhada. (image source: A Tribute to Hinduism: Thoughts and Wisdom spanning continents and time about India and her culture - By Sushama Londhe). 436. John Moffitt ( ) a graduate of Princeton and the Curtis Institute of Music, was a monastic member of the order of Ramakrishna for 25 years and then became a Catholic. In his book, Journey to Gorakhpur he gently leads the Westerner to shed his cultural imperialism in an encounter with the ongoing vitality of Indian tradition. He said that Christians must guard against a premature assumption that God intended everyone in the East to become a professing Christian. "The majority of the people in the West have largely misunderstood both (Hinduism and Buddhism) religions. Up till now these ancient faiths have been devoutly misrepresented by most scholars who are professing Christians." "Hinduism's doctrine of the "divinity" of the soul, the non duality of the Godhead, the unity of existence, and the harmony of religions were strongly appealing and he joined the Ramakrishna Order of India, working at the Ramakrishna-Vivekananda Center of New York under the direction of Swami Nikhilananda." "In India, after all, religion is like the air you breathe, and almost every Hindu's given name had a religious association. But is is not just a matter of conventions. Even villagers who practice what look to Westerners, like grossly superstitious forms of worship are not unfamiliar with many of the subtleties of what we in the West would call scholastic philosophy." "The Upanishads announce the advent of a new consciousness of the nature of ultimate reality. Even among the earlier hymns of the Vedas we find one or two that contain speculations about the first cause of the universe. But with the Upanishads we have a new and liberating revelation. The Upanishads record the efforts of the later Vedic sages to communicate to qualified pupils what they had found as a result of their quest for the True Self of man and the Divine Ground of the Universe. These treatises, though they still reflect some of the earlier beliefs, offer a profound insight into the nature of ultimate reality and of the soul. Traditional Christian thought would no doubt brand the Upanishadic record as heretical. Yet, from the point of view of intuitive wisdom, it is far more explicit about the soul's relationship to God than any of the books of the New Testament." The use of the phrase "the truth of truth" has a peculiar fitness in the Hindu context. In India men have from time immemorial emphasized the centrality of truth. The Rig-Veda, the earliest of Indian scriptures, declares: "It is truth that bears up this earth." "The Self is never born, nor does it ever die, nor, having once been, does it again cease to be. Unborn, eternal, permanent, and primeval, it is not slain when the body is slain." "Weapons cut it not, fire burns it not, water wets it not, the wind does not wither it." These few quotations from the Bhagavad Gita, like those from the Upanishads, offer only an infinitesimal hint of the rich variety of experience in the form of intuitive wisdom to be found in the Hindu canonical scriptures. They show the kind of thinking and experience that preoccupied the later Vedic seers. The Taittiriya Upanishad, a source book for Shankara's Vedanta philosophy, says, "The Satya (the Truth) became all this: whatever there is." And this veneration of truth has continued into modern times. 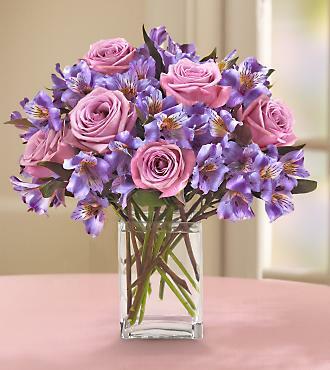 It is well known that Mahatma Gandhi, though for many years in the habit of saying, "God is Truth." Perhaps without knowing it, he had gone back to the Vedas. The Hindu scriptures abound with reference to acts of truth. When the earth opened at Queen Sita's bidding, in the Ramayana story, and when she passed through the flames unscathed, what happened bore witness to her perfection in truth. The Bhagavad Gita not only illuminates but carries forward the teachings of the Upanishads in a grand synthesis whose potentialities were only fully realized in India over two millenniums later. In his instruction, Lord Krishna defines not only what Arjuna's duty is as dictated by his position in society, but also the basis of belief for those who by nature emphasize the voice of intuitive wisdom. Followers of this voice speak of the Bhagavad Gita as a dialogue between the Supreme Self and the individual self. "The unreal never is," Krishna says. "The Real never ceases to be...That by which all this is pervaded know to be imperishable...The Self is never born, nor does it ever die, nor, having once been, does it again cease to be. Unborn, eternal, permanent, and primeval, it is not slain when the body is slain." "Weapons cut it not, fire burns it not, water wets it not, the wind does not wither it. Here we have the Upanishadic doctrine of Atman, spelled out in slightly greater detail. These few quotations from the Bhagavad Gita, like those from the Upanishads, offer only an infinitesimal hint of the rich variety of experience in the form of intuitive wisdom to be found in the Hindu canonical scriptures. They show the kind of thinking and experience that preoccupied the later Vedic seers. Those who followed them in the post-Vedic age, by weaving their findings into the stories of legendary heroes, made these available to average man. They also provided future generations with their first detailed, though perhaps partly idealized, view of everyday life in ancient India." The Bhagavad Gita offers a highly refined and well-balanced exposition of love of God. (source: Journey to Gorakhpur: An Encounter with Christ beyond Christianity - By John Moffitt p. 1 - 89). 437. Samuel Johnson (1822- 1882) went to private schools, Harvard, and then Harvard Divinity School from which he graduated in 1846. Among his class mates were Octavius Brooks B Frothingham and his lifelong friend Samuel Longfellow, brother of Henry Wadsworth Longfellow. Johnson was a minor Transcendentalist whose faith was centered in naturalism, and he rejected much of Christian tradition as revelatory, and held little faith in established institutions always refusing to join any organized groups. His later years were devoted to study and writing. He often looked outside of Christianity for his inspiration. In his hymn. “Life of Ages,” he writes, “never was to chosen race that unstinted tide confined.” His work on eastern religions was especially important. He published three volumes of his Oriental Religions. These were India (1872), China (1877) and Persia (1885). 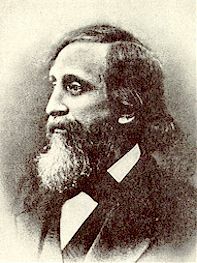 Johnson shared characteristics with Emerson’s Transcendentalism; like Emerson, Thoreau, he was capable of seeing daily life in terms of Hinduism. He has termed the Hindu mind the “brain” of Asia , being “subtle, introversive…cerebral,” made for mediating between thought and work. About The Mahabharata and Ramayana he notes that they “glow with a luxuriance of imagery which contrasts with the Iliad or AEneid as the stupendous vegetation of India differs from that of Italy or Greece . All that this colossal people have dreamed or done in philosophy, mythology, ethics, in imaginative or didactic thought, is here transmuted into song." He was a man with a scholarly bent of mind and for a single statement about the antiquity of Hindu devotionalism he cited pages from Muller, Whitney, Duncker, Koeppen, Colebrooke and Lassen. He was able to provide an extensive and clear and accurate portrayal of Hindu gods and practices. 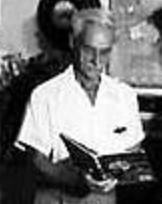 His discussions of Indra, Varuna, Vishnu and Agni and their counterparts in the Greek and Hebrew religions; his discussions of the Laws of Manu, the caste system, Vedanta, Sankya, transmigration, and Buddhism spanning in total over eight hundred pages demonstrate Johnson's interest and scope. He wrote that Buddhism remained within the old Hindu circle. (source: American Transcendentalism and Asian religions - By Arthur Versluis p 100 - 262). 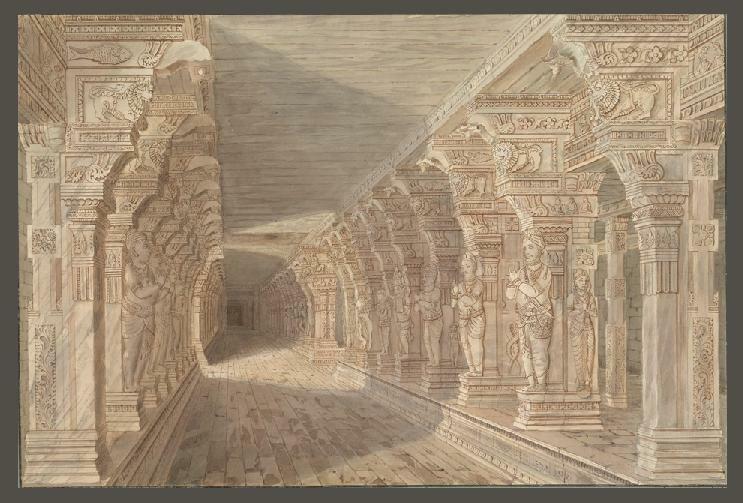 “At its culminating point, Indian art does not attempt to represent eternity through the fleeing moment, duration through change or god through nature, on the contrary: it makes change appear through permanence, the variable through identity." “As an example he quotes the Trimurti at Elephanta, where the triple-faced head of Shiva shows the three aspects of Shiva as Brahma (the creator), as Vishnu (the preserver), and as Rudra (the destroyer), thereby achieving the ever sought after identity of form and content. (source: Treasures of Indian Art: Germany's Tribute to India's Cultural Heritage - National Museum p. foreword by Dr. Georg Lechner, Director Goethe – Institut Muechen). 439. Martin Gray ( ) is an anthropologist and photographer specializing in the study of sacred sites and pilgrimage traditions around the world. His father was in the US diplomatic service and was privileged to travel widely around the world. When he was twelve years old his family moved to India for four years. During this period he went on frequent journeys, both alone and in the company of wandering holy men, to the temples, mosques and sacred caves of India , Nepal and Kashmir . Reading widely in the fields of Buddhism and Hinduism, he became intrigued with the beauty and mystery of the sacred places of India. During the past eighteen years, Martin has visited and photographed over 1000 sacred sites in seventy countries. 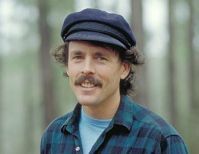 His efforts culminate with a beautiful website called Places of Peace and Power, which can be found at: www.sacredsites.com. "In India we find the oldest continually operating pilgrimage tradition in the entire world. The practice of pilgrimage in India is so deeply embedded in the cultural psyche and the number of pilgrimage sites is so large that the entire subcontinent may actually be regarded as one grand and continuous sacred space." Refer to chapter on Nature Worship. "In discussing pilgrimage places in the Hindu tradition, it is important to say a few words about the number and diversity of deities in Hinduism and about the iconic and aniconic forms in which those deities are found. The personification of the mysterious forces of the universe into the anthropomorphic deities of the Hindu tradition involves both a convergence into certain supreme deities (the main three deities today are the gods Shiva and Vishnu and the goddess Shakti) and a splintering into a myriad of lesser deities. Certain writers call this polytheism, but the term is inaccurate in this case." Hindu seriously believes in the multiplicity of gods but rather is aware that each of the many gods and goddesses are merely aspects of the One God (who is also the god of all other religions). The majority of Hindus ally their beliefs with one or the other of the three cults, worshipping Shiva, Vishnu, or Shakti as the highest principle. In doing so they do not deny the existence of the other two deities but regard them as complementary, though minor, expressions of the same divine power. Hinduism is thus, in its essence, monotheistic; a Hindu's worship of a particular personal deity is always done with the awareness that all deities are simply representations of one unconditioned, transcendental, supreme existence, known as Brahman. Each of the greater and lesser deities is understood as a sort of window or lens through which the whole of reality may be glimpsed. The primary intention of a pilgrim's visit to a holy site is to receive the darshan of the deity resident in the temple's inner sanctum or open-air shrine. The word darshan, difficult to translate into English, generally means the pilgrim's having a sight and/or experience of the deity. Hindus believe that the deity is actually manifest in the image, statue, or icon of the temple. To receive the darshan of the deity is to have a spiritual communion with it. The image of the deity may either be an iconic, or representational, image that bears some resemblance to its mythic subject; or an aniconic form that merely symbolizes the deity. In a large number of celebrated shrines in India no beautiful statues of the gods and goddesses are found, but only aniconic blocks of stone or stumps of wood. This tradition of aniconic images derives from the rural folk religions of ancient India and bears witness to the great antiquity of the sanctity of certain places. 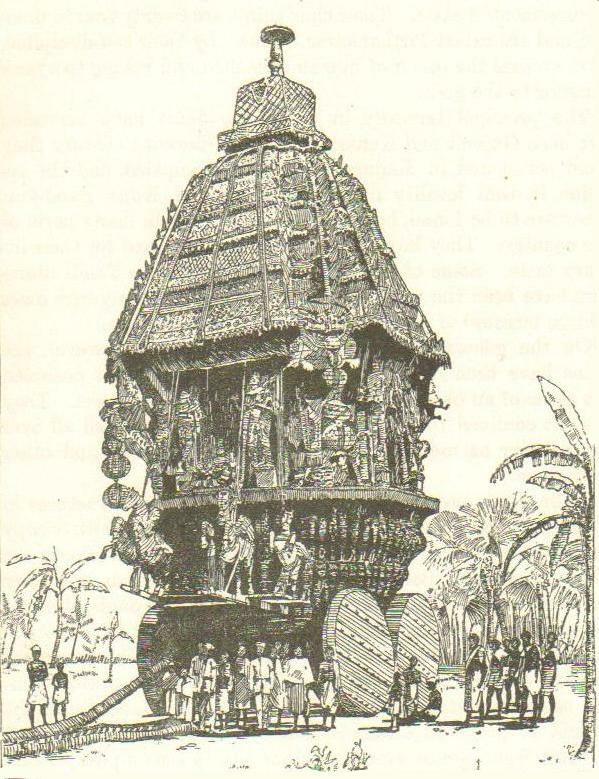 The shrine in its initial phase may have been only a crude little hut covering a stone that both represented and contained some spirit of the natural world. As millennia passed and the small rural village grew slowly into a larger and larger town, both the myths concerning the stone and the shrine surrounding that stone were richly elaborated. It is therefore important when studying or visiting the monumental pilgrimage shrines of India to rememberthat they had their architectural genesis in the simple nature sanctuaries of the pre-Aryan rural folk. 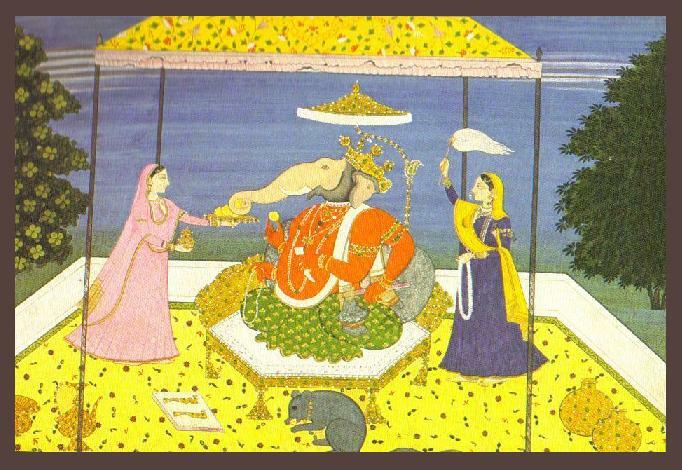 Lord Ganesha Kangra c.1815 Bharat Kala Bhavan. Hinduism is thus, in its essence, monotheistic; a Hindu's worship of a particular personal deity is always done with the awareness that all deities are simply representations of one unconditioned, transcendental, supreme existence, known as Brahman. Each of the greater and lesser deities is understood as a sort of window or lens through which the whole of reality may be glimpsed. The myths and legends of these sacred places have their roots in the ancient peoples' felt experience of the characteristics or qualities of the natural place. The various mythological personality characteristics of the deities in pilgrimage shrines may therefore be interpreted as metaphors for the way in which the spirit of the place has affected human beings. This spirit of place is not just a fanciful story, it is an actuality, an energy, a presence that touches human beings and affects them profoundly. Why are certain places said to be the dwelling place of a feminine deity and others the dwelling place of a masculine deity? Is it not perhaps because some ancient rural people, deeply in touch with the earth as a living entity, sensed either a feminine or masculine presence at a place and spoke about it in anthropomorphic terms? These terms were then given representational form by the artistic rendering of a statue or image. Looking deeper into this matter, let us then ask why there are not simply male and female deities but, more precisely, why there are different kinds of male and female deities? Conventional explanations refer to such things as the fanciful human imagination, the rich and varied proto-religious inputs into formative Hinduism, and prehistoric deification of charismatic human figures into legendary archetypes. While all these things did occur, they are not the only explanations. The central premise of my theory is that the different personality characteristics of the deities derive from the various characteristics of the Earth spirit as it manifests at different geographical locations. To understand the quality or character or power of a place, we need only study the nature of the deity enshrined there. Encoded in the deity's mythological form is a clear message telling us how the sacred site will affect us. (source: Sacred Places: Sacred Sites, places and temples in India - By Martin Gray). 440. Mani Bhaumik ( ? ) is a Bengali elected fellow of the American Physical Society as well as the Institute of Electrical and Electronics Engineers and is the author of the bestseller Code Name God. He is the co-inventor of the laser technology that made LASIK surgery possible. Bhaumik says ancient Indian philosophy, put into action by Gandhi, has its counterpart in modern science. He says both try to explain the cosmos and improve the world. “The compilers of the Vedas were the first monotheists, Bhaumik points out. (source: Physics & Vedanta: So much in common – By Mani Bhaumik – bikramyoga.com and Code Name Success – India, Life and Style).